Introduction: Since its initial introduction, minimally invasive technique has gained widespread application across multiple disciplines of surgery. Although a growing number of surgeons employ minimally invasive surgery (MIS) in their daily practices, adequate training with advanced and sub-specialized MIS approaches remains a challenge for many general surgical residency programs. The Fellowship Council currently provides access to postgraduate education in 135 MIS fellowships in North America. Fellowships are offered through institutions specializing in MIS; however, the training in these programs is generally limited to a specific field of advanced MIS in a singularly focused academic or private practice environment. The Minimally Invasive Surgeons of Texas (MIST) represents a novel model for fellowship training dedicated to promoting the advancement of minimally invasive, laparoscopic, and endoscopic surgical techniques. Methods and Procedures: MIST is comprised of 4 autonomous fellowship programs each accepting 2 MIS clinical fellows per year, but functioning as a unified consortium. Fellowship directors have an academic appointment and fellows are designated as clinical instructors in the Department of Surgery at the University of Texas Medical School at Houston. Fellows rotate through private and academic practices of the MIST consortium, facilitating program consolidation for academic interaction, skills training, and clinical research. The goals of the MIST consortium are comprised of 3 expansive areas: (1) fellow education, (2) faculty and fellow research to promote advancement and best practices of MIS, and (3) consortium promotion as a paradigm for superior training. Results: Each fellowship program maintains an operative skills training curriculum representative of general MIS and the sub-specialty procedures of the rotation. Three of the programs have each been designated as a Bariatric Surgery Center of Excellence (BSCOE). The BMI Bariatric and MIS Fellowship Program offers experience with high volume bariatric and advanced laparoscopic training. The Fellowship in Laparoscopic Endoscopic Surgery Program provides experience in basic and advanced laparoscopic procedures as well as a large caseload of flexible endoscopy in a private practice setting at a community hospital. The University of Texas Health Science Center at Houston Minimally Invasive Surgeons of Texas Fellowship Program includes clinical and research opportunities through their academic program. Fellows receive a broad clinical experience with emphasis on bariatric surgery, including high volume robotic bariatric procedures. The University of Texas Minimally Invasive Colon and Rectal Surgery Fellowship Program is the first and only accredited MIS colorectal program in the country, offering exposure to a high volume of diverse approaches including conventional, hand-assisted, single-incision, and robotic-assisted laparoscopic techniques. In addition to the clinical exposure, the consortium provides an active platform for clinical and evidence-based research models for academic participation in national meetings. 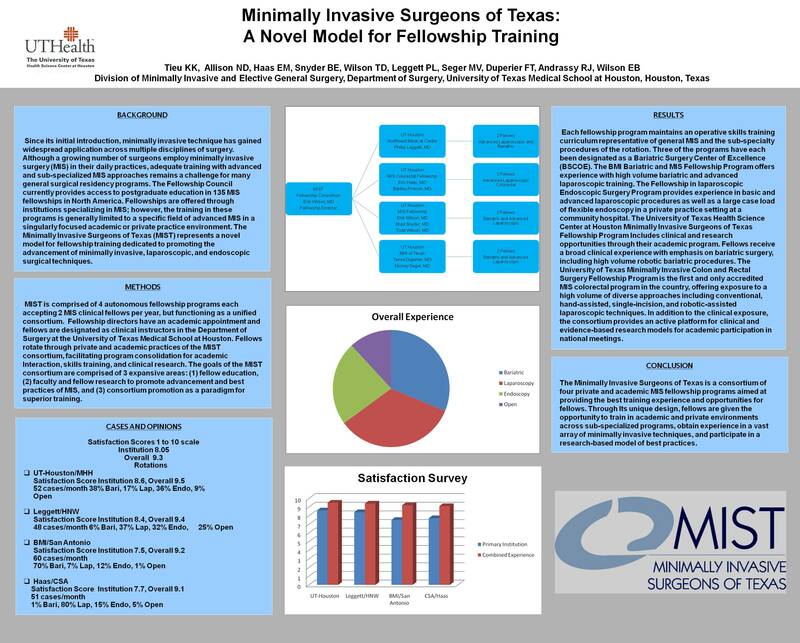 Conclusions: The Minimally Invasive Surgeons of Texas is a consortium of four private and academic MIS fellowship programs aimed at providing the best training experience and opportunities for fellows. Through its unique design, fellows are given the opportunity to train in academic and private environments across sub-specialized programs, obtain experience in a vast array of minimally invasive techniques, and participate in a research-based model of best practices.